Rumpelstiltskin (Dunstan Playhouse, Adelaide) | Daily Review: Film, stage and music reviews, interviews and more. Fresh from her critically lauded feature film debut, Girl Asleep, Windmill Theatre co-artistic director Rosemary Myers turns her undoubted talents to Rumpelstiltskin, a freewheeling adaptation of the Brothers Grimm fairytale co-written with frequent collaborator Julianne O’Brien. It’s the third installment in an unofficial trilogy of children’s theatre works co-produced with the State Theatre Company of SA, following on from The Wizard of Oz in 2009 and Pinocchio in 2012. Anybody who saw those shows – I somehow managed to miss Pinocchio but can testify that The Wizard of Oz, with Ursula Yovich as Dorothy, was a bighearted marvel – will recognise swathes of the creative team here: designer Jonathan Oxlade, composer and musical director Jethro Woodward, and performers Ezra Juanta and Alirio Zavarce. 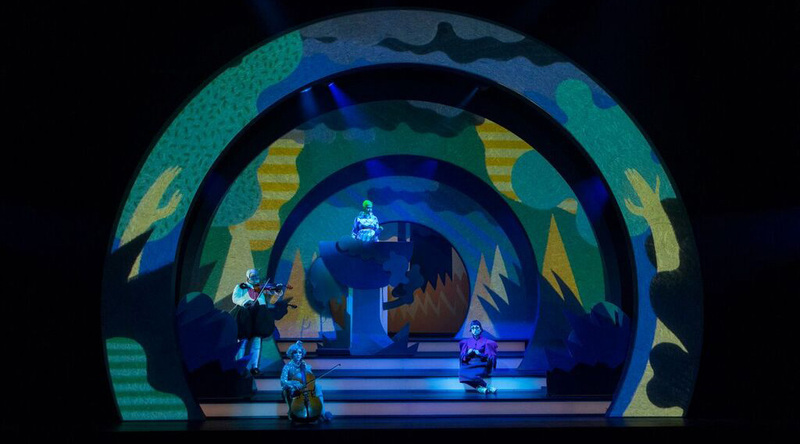 Also familiar will be Myers’ aesthetic: flamboyant and retro, sheened with a 1970s palette – dark brown and warm earth tones – rather than the high gloss of much contemporary children’s theatre. At first glance, the Rumpelstiltskin story seems an unlikely vehicle for all this. It is, perhaps, as old as 4,000 years and is best remembered for its ending, grisly even by the standards of the Brothers Grimm: having been outwitted by the Queen who promised her first child to him, Rumpelstiltskin – a goblin or ‘little mannequin’ who can magically spin straw into gold – literally tears himself apart in rage. But, as with Rumpelstiltskin himself, Myers and O’Brien transform the raw material at hand, creating something new and lustrous, and unapologetically contemporary. In place of the original story’s initiating trio of King, miller, and miller’s daughter, we are simply left with the daughter, a down-on-her-luck young girl called Harriet (Ashton Malcolm) whose life is changed by a chance encounter with Rumpelstiltskin (Paul Capsis pictured above), an anonymous but brilliant haute couture fashion designer. The company that bears his name is run by the unscrupulous Crow (Elena Carapetis) and Rat (Alirio Zarvace), who have deemed Rumpelstiltskin too monstrous for the public eye and replaced him with an airheaded model whose real name is Malcolm (Matt Crook). In the first of a series of increasingly onerous Faustian pacts, Rumpelstiltskin gets Harriet a job in sales at the company (where she meets new BFF Tootie, played by Michaela Burger). In the story, it is the King who is overcome by greed, demanding that the miller’s daughter, with the secret aid of Rumpelstiltskin, spin bigger and bigger roomfuls of straw into gold; here it is Harriet, a social climber with stars in her eyes who soon surrenders her long, Rapunzel-like braid – she’d been trying to grow it to 100 centimetres – in order to access the private lift, gateway to level five and the personal living quarters of Rumpelstiltskin (aka Malcolm). With yet another miraculous intervention from the real Rumpelstiltskin, Malcolm’s affections are diverted from Tootie to Harriet, thus paving the way for the gravest pact of all, and the one most familiar from the fairytale as told by the Brothers Grimm: that Harriet will give her first child to the goblin. The twist, which robs the story of some of its dark fascination but sets up a pleasantly surprising end to the first act, is that Harriet doesn’t sign up to give away her prospective baby straight away. Instead, she promises to give to Rumpelstiltskin what will be most precious to her once she’s settled down with Malcolm. This, at first glance, seems to be all the glittering material trappings of the highlife rather than her own child. (Is it too much to suggest this ostensible futures contract is Myers’ sly dig at the financiers partly responsible for the Global Financial Crisis?) It’s only when we see Rumpelstiltskin in sinister silhouette, carrying off the baby at the close of the first half, that we realise, just as in the story, all the treasures of the world are as nothing to a living being as far as he is concerned. In their joint program notes, Myers and O’Brien describe the elements intrinsic to their style of adaptation: ‘The script has to be fast, funny, uncomplicated yet full of love, and opportunities for great music and eye-popping visuals!’ Taking them at their word, allow me to compensate for my long plot summary – important, I think, with a show that diverges so significantly from its well-known source material – by making a few points about each. ‘Fast’: yes, though arguably not fast enough. At two hours (including interval) it’s long for a show for children. Speeding through it, I suppose, would be one solution, but better if a little judicious editing could bring the whole thing down to a brisk 60 to 90 minutes without a break (to preempt a point, not all of the songs are great, or narratively useful, and could be profitably cut). ‘Great music’: as with Wizard of Oz and Pinocchio, Jethro Woodward’s songs are pop-oriented and borrow from a range of (mostly retro) styles: early rock and roll and hip hop (Bo Diddley to big beat! ), ’70s glam and ’80s power balladry. The cast, who also periodically fill out the small band in the pit (most of the music is prerecorded), adding vocals, ukulele and other instruments, handle all this variably. Naturally, it’s the music theatre specialists, Capsis and Burger, who fare best. It’s half an hour before we hear Capsis’ famous falsetto – in actuality, just one side of his extraordinary range – but the wait is worth it, while Burger brings the house down in the second half with the night’s best tune, a glittering, minor key-dipping torch song that sounds like some long-lost cut from Cyndi Lauper’s She’s So Unusual. Of the other performers, only Juanta gets close to these heights, proving an unexpectedly soulful infant after his rescue from Rumpelstiltskin’s clutches. ‘Eye-popping visuals’: virtually a guarantee by now, I would have thought, with a Myers’ production. Jonathan Oxlade’s design is excellent: a series of decreasingly sized concentric circles frames a raked, many-leveled stage onto which lively animation – by Chris Edser and Lisa Vertudaches – is seamlessly projected, giving the action and transitions an exciting fluidity (no clunky scene changes!). The animations themselves are great fun, spooky in places and in others funny, irreverent like the best cartoons but visually simpatico. And ‘uncomplicated and full of love’? If by simple Myers and O’Brien mean simply told then I agree. Although a technically complex show, the thrust of the narrative, even with its sweeping departures from the story as we know it, is never less than clear. As for love, that’s there too, in Ashston Malcolm’s lovely, humanely rendered Harriet, and even in Capsis’ Rumpelstiltskin – not, despite those wonderful flourishes of pantomimic villainy, simply an irredeemable bogeyman. Perhaps the happy ending takes all this a bit too far in swapping out the original story’s gruesome comeuppance for a sort of Addams Family-lite reconciliation of all these outsiders, captured for posterity on the family Brownie. But in the hands of Myers and O’Brien it’s less a story about Rumpelstiltskin’s wickedness than it is about Harriet’s – and, by extension, our – susceptibility to the greedy pursuit of fame and fortune. Thankfully, there’s no moral grandstanding at the end – the point, like the updated story itself, is simply made, and all the more resonant for it. Rumpelstiltskin is a Windmill Theatre Co and State Theatre Company of SA production at the Dunstan Playhouse until October 30. Photos by Shane Reid. I actually think we’re in more agreement than you acknowledge! Perhaps I didn’t make this clear enough but my issue with the production’s length was less to do with the fact it might bore children (there was little evidence of this on opening night) than that I feel the show could have been as strong, or even stronger, with some tightening of the script. As you say, there is much here for adults to enjoy too – something Windmill are very good at. I don’t feel I was ‘unnecessarily harsh’ as regards the music. As I wrote, there is some very fine songwriting here that draws on all sorts of forms, and not just those usually associated with musical theatre (and you’re right about the vocal deliveries, which is why I singled out Capsis and Burger – music theatre specialists – as handling Woodward’s songs more convincingly). Although not quite as enthusiastic as you about the production – I still think the script could hold together better – I wouldn’t disagree with the thrust of anything in your last paragraph. As regards the design, I can do no better than Myers and O’Briens’ own description: eye-popping! What I love about Windmill so much is that is that they don’t underestimate children whether it be in terms of the issues they tackle, level of sophistication and complexity of ideas or length of their works. I completely disagree with you about this being too long for children. 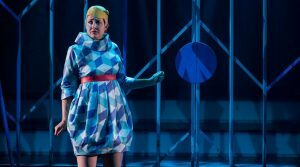 Much to the credit of the cast, creatives and crew, like Pinocchio before it, my children were captivated and largely because Windmill aren’t afraid to be gutsy in their work and know how to keep their audience’s attention through inventive design, performance and direction. There was no wriggling, fussing or “is it nearly over with?” type comments coming from the mouths of babes during Rumpelstiltskin. I think it’s a little narrow sighted to simply lump this production into being a work made solely for children which framing it within the parameters of ‘too long for kids’ does. I felt that this was just as much for me as it was for all ages and was greatly impressed by the Company’s ability to do this (always a relief for parents!). This is not a musical in the traditional sense in terms of musicality and this is what is so brilliant (great!) about this work. The makers didn’t take a paint-by-numbers approach to musical theatre and it’s all the better for it. Essentially, this is a musical unconstrained by the conventions of the musical genre (not even the sub-genres of the ‘rock’, ‘indie’, or ‘contemporary’ musicals which are, in themselves, now have heavy signifiers) and this is the very reason the songs are so great. I seemed to be at another show to the reviewer and feel comments about the songs are unnecessarily harsh on the music – seriously, it’s a pretty amazing accomplishment to put music to someone’s words and turn them into songs for an entire show! The music was beautiful and an integral force in the performance (the underscore was absolutely breathtaking too) although there were some pitchy vocal deliveries from some of the actors. Overall, this production is a masterclass in sound design, composition, lighting, animation, set and costume design and appropriate use of special effects. The creatives have brought to life a truly unique world they should be commended on. The ensemble were multi-talented joining the band in the pit, were skilled entertainers and drew the young, the middle and the old into their magical world for pure escapism. Special mention to the peerless Paul Capsis and the performers who played Tootie, Baby, the Rat and the Crow for that indefinable something you brought to your performances.